A cleverer, more creative, more thoughtful expansion than The Dark Below, House of Wolves is Destiny at its best, with a host of fresh improvements. There's a moment in one of House of Wolves' campaign missions that is pure Halo. I won't spoil too much, but here's the gist: you emerge onto a wide-open field of battle. A fleet of alien ships hang in the sky. A few of them peel off, descend, and deploy troops in a semi-circular arc ahead of you. The music picks up. Choose a direction. Fight. It's a scenario straight out of Bungie's classic playbook: the open arena, the shooter refactored as a strategic puzzle game where your finesse, situational awareness and cunning allow you to line up and eliminate enemies like Bejewelled gems. Both Destiny's launch campaign and The Dark Below leaned a little too heavily on corridors packed with bullet-sponge foes: House of Wolves learns that lesson, furnishing you with five new missions each with its own memorable set-piece battle. They are, however, rather brief. Destiny's dip-in, dip-out structure still struggles to ground you in an ongoing campaign. You're encouraged to flit from one activity to the next - and there are many good reasons to do so, as I'll get to. As a result these well-designed missions feel a little like vignettes rather than parts of a cohesive whole. Bungie has, however, revised its attitude to storytelling. The titular House of Wolves are a splinter faction of the Fallen, formally aligned with the strategically-neutral Queen of the Reef (you encountered them briefly during Destiny's launch campaign) and now on a rampage throughout the solar system. You hunt them with the help of the Queen's emissary, Petra Venj, and Variks of House Judgement - a Fallen who speaks human, the first opportunity we've had to get inside the heads of Destiny's villains. Both are well-performed, interesting, and sometimes darkly funny - and both help to draw out parts of Destiny's absurdly deep and absurdly opaque backstory. The campaign also introduces a new social hub, an Awoken asteroid base in the Reef. It's neither as big nor as interesting as the Tower - it's basically a big square - but the atmospheric music helps to establish a sense of place. It's here that you'll pick up bounties for the Queen that task you with tackling new public events or hunting new enemies that lurker in lesser-trodden parts of the open world. It's also here that you get access to Destiny's two-part new endgame: the Prison of Elders and the Trials of Osiris. Here's a tip for lore hunters. Next time you're in the Cosmodrome, revisit the area you spawned in when you created your character - it's accessible via a tunnel from the Divide, newly-opened and occupied by Wolves. Once you're outside, look back at the wall behind you. Up and to the right is a gantry next to some broken windows. Jump up there and move along to find a dead Ghost that unlocks a hidden Grimoire card. Read it to uncover the truth behind the liberation of the House of Wolves. The former is a measured response to the ambitious but flawed six-man raid system. It's a three-person arena mode with randomised modifiers - each cell from the Prison of Elders contains a different enemy type and a different set of objectives, and beating five of them grants you access to a coveted treasure room. Destiny's basic gunplay systems are strong enough that it doesn't need to be any more than this: in doubling-down on raw combat and reducing the fireteam size, Bungie have actually opened up the potential for creative or heroic play. There's far less capacity to cheat, and the need to rush about to disarm mines or take down high-value targets makes hiding far less appealing. It's also much more accessible. 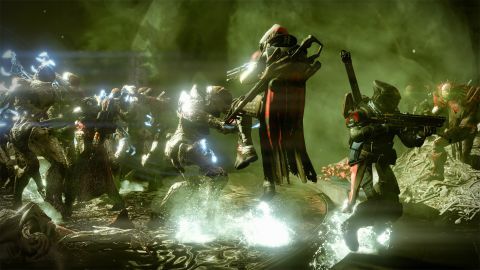 The basic version of the Prison of Elders is a level 28 matchmade activity, meaning that you don't need to find a group to jump in and play. Beyond that, each week will bring a different level 32, 34 and 35 variant on the Prison with scaling rewards. These do require you to find a group, but present such a steep challenge that you'll be glad you brought people you know. Even at its hardest, however, Prison of Elders doesn't feel as punishing or arbitrary as Crota's End. It's bad news for committed six-person teams, but a positive progression for the game as a whole. Trials of Osiris provides - for the first time - a proper endgame for competitive Destiny. It's a Crucible event, a little like Iron Banner, that runs every weekend. It takes place in a new mode, three-on-three elimination. With no automatic respawns, you're reliant on your teammates for revives. Whichever team survives gets a point, and the first team to five points wins the match. You enter by picking up a ticket from a new vendor in the Reef and this ticket tracks your wins and losses. Each win you rack up gives you access to better rewards, but lose three times and you have to cash it in and start over. It is punishingly hard and proof that Destiny has a future as a competitive game. Familiar concepts like Supers, heavy ammo and weapon choice take on vastly more significance here where the stakes are so high, and you've never felt more grateful to a co-op buddy then when one of your teammates turns around an impossible three-on-one fight to take the game. Racking up nine wins on a single ticket was one of the most exciting things I've ever done in a competitive game, let alone in Destiny. The flipside to this is that Trials of Osiris simply isn't going to appeal to a lot of people. You need to arrange your own team, for one thing - matchmaking is disabled. Rewards are also distributed according to skill in a way that is quite unlike the rest of the game. Destiny is, traditionally, a game where you 'participate to accumulate': as long as you take part you'll eventually get all of the items you need. Even those who don't enjoy Crucible can get all of the Iron Banner gear as long as they keep playing. If you do return to the Crucible, you'll find three new maps (with a fourth on PS4.) Widow's Court gives us our first glimpse at a new part of Earth - in this case, the European Deadzone - and blends tight urban combat with open areas that have multiple levels of elevation. It reminds me, more than anything else, of the street-to-street combat of the World War II-era Call of Duties. Black Shield is near-symmetrical and well-suited to Control, with the distinction of providing a capture point B that is easier to attack than it is to defend. The Timekeeper, exclusive to PS4, takes place inside a labyrinth of Vex machinery. To my mind, it's the weakest of the set - visually monotonous and suffering from the same corner-camping pedantry that afflicts its Dark Below counterpart, Pantheon. The arcing curves of Fallen and Cabal architecture simply make for better competition. This is demonstrated by Thieves' Den, my favourite, a narrow series of caves on Venus that open up into four memorable arenas - a cliffside, a deep valley, a cover-strewn atrium and the top of a Fallen skiff. Concurrent with the launch of the House of Wolves, Bungie have also overhauled the game's gear progression system. These changes are available to every player but they play well into the expansion's strengths. In short, you no longer need to grind for materials to get the most out of your weapons and armour. The most important values - attack, armour, Light - are now fixed at their highest value, so you only need to level up to unlock bonus perks. Instead, you'll sink your resources into reforging - a process that allows you to re-roll the bonuses on new Legendary weapons in pursuit of the perfect gun. You can also upgrade any Legendary, including armour, to the new level cap - meaning that with enough time, you can create a max-level character that looks exactly how you want them to. Destiny is no longer about grinding to the level cap: it's about getting there with a different gear set for every occasion. These changes arrive alongside a vast number of new weapons, Exotics, armour sets, shaders, ships, and so on - far more than The Dark Below provided. There is also, for the first time, a new weapon type: the sidearm. These are rapid-firing pistols, equipped in the special weapon slot, that provide clutch firepower in a pinch and can be used to suppress certain enemies. If there's a downside to this pile of extra collectibles, it's that Destiny's lamentable lack of storage space has escalated from an inconvenience to a full-on crisis. Anxious packrats notwithstanding, House of Wolves is essential for existing fans. It's the game you like, but faster, more exciting, and more generous. For those who remain unconvinced, however, this isn't the ground-up reinvention you might have been hoping for. Destiny hasn't become a singleplayer experience. But it has become easier to appreciate it for what it is: an expansive and absorbing hobby-shooter, a mixture of pin-sharp gunplay, inventive co-op and deep customisation unmatched anywhere else. It's not Halo. It doesn't need to be. It's Destiny.